BO843. 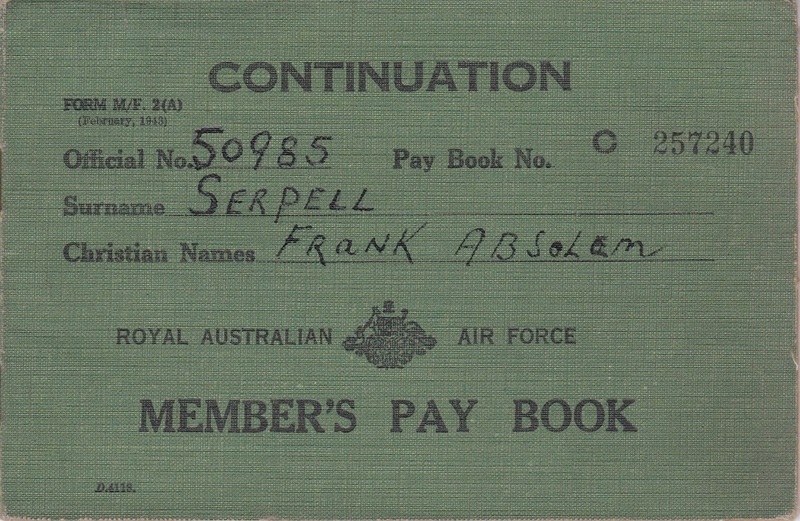 A dark green pay book named to 50985 Frank Absolem Serpell who was born on 9 Aug 1917, enlisted at Mudgee on 26 Aug 1942 and discharged as a Leading Aircraftsman on 25 Mar 1946 from No 2 Aircraft Depot. BO849. 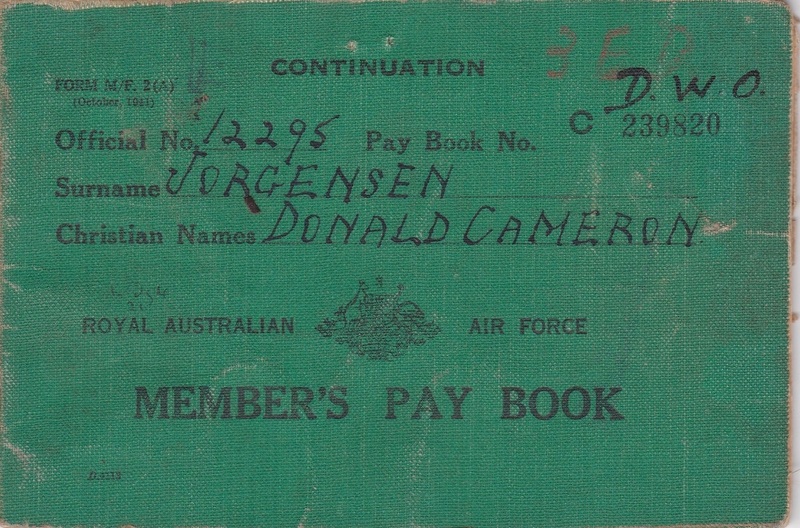 A mid green pay book named to 12295 Donald Cameron Jorgensen who was born on 30 Oct 1920, enlisted at Brisbane on 14 Feb 1940 and discharged as a Sergeant on 11 Jan 1946 from No 3 Personnel Depot. BO849. 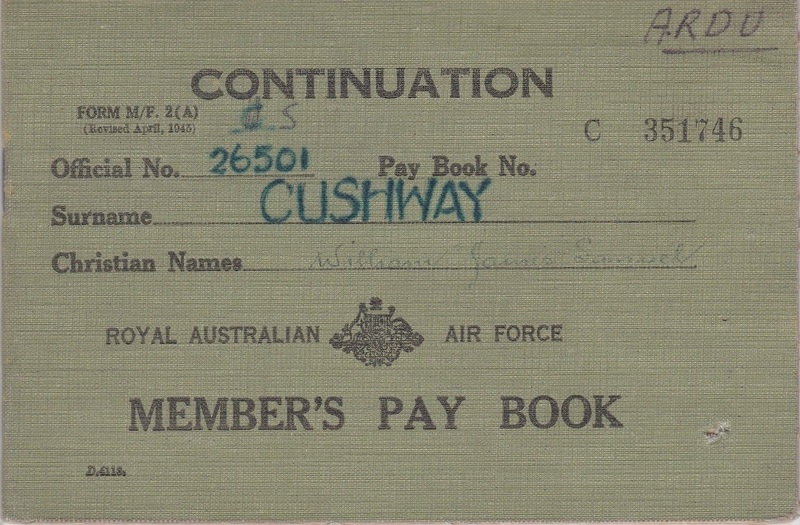 A khaki pay book named to 12295 Donald Cameron Jorgensen who was born on 30 Oct 1920, enlisted at Brisbane on 14 Feb 1940 and discharged as a Sergeant on 11 Jan 1946 from No 3 Personnel Depot. BO849. 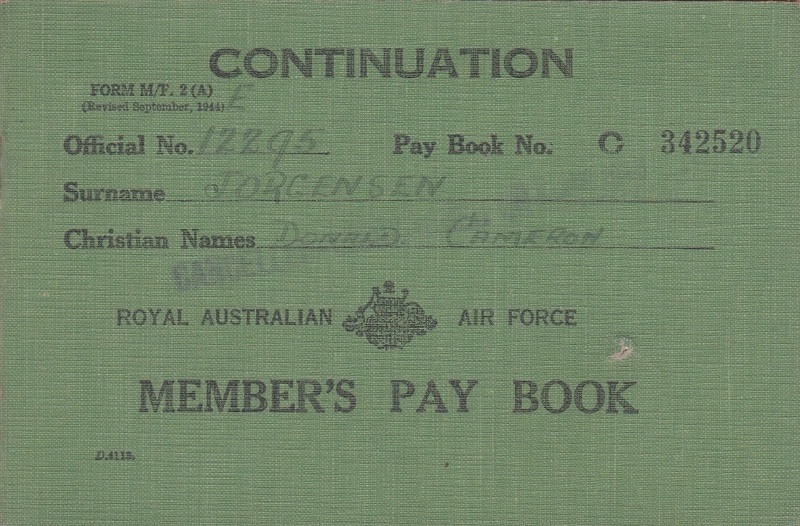 A green pay book named to 12295 Donald Cameron Jorgensen who was born on 30 Oct 1920, enlisted at Brisbane on 14 Feb 1940 and discharged as a Sergeant on 11 Jan 1946 from No 3 Personnel Depot. BO885. 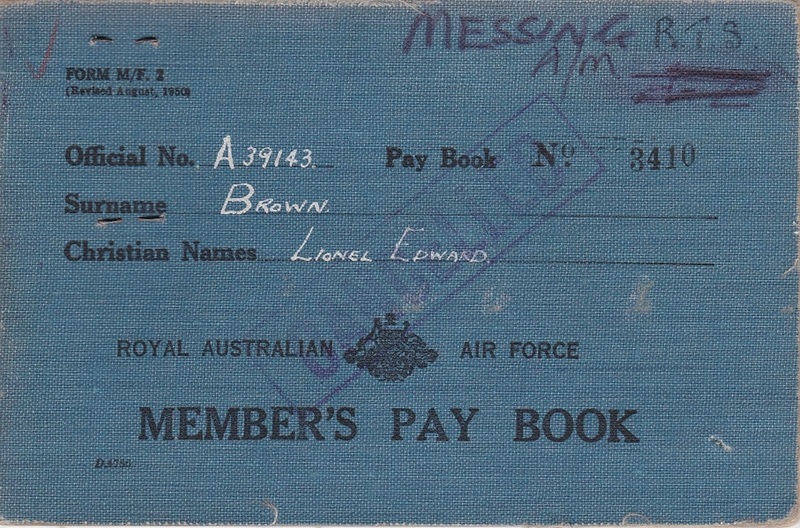 A light blue pay book named to A39143 Ronald Daniel Brown who was born 25 May 1912 and enlisted 25 Jul 1966 as a Clerk. BO923. 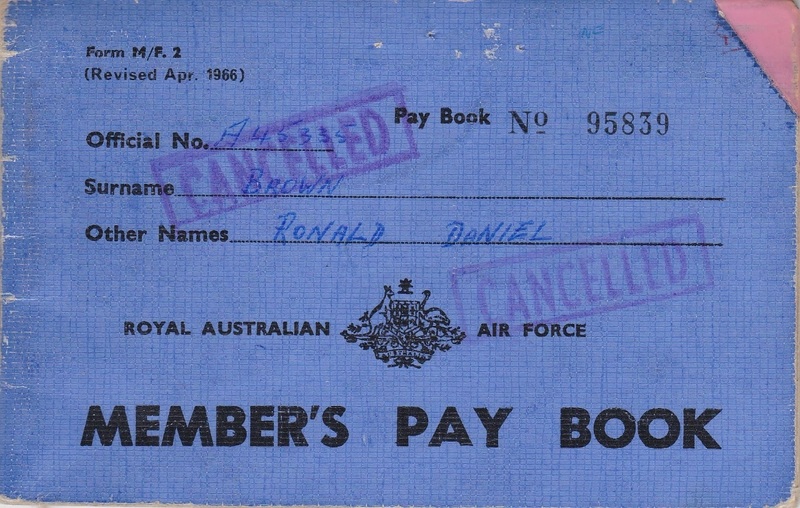 A light blue pay book named to A45335 Ronald Daniel Brown who was born 17 Feb 1933 and enlisted 19 Sep 1952 as a Steward. BO924. 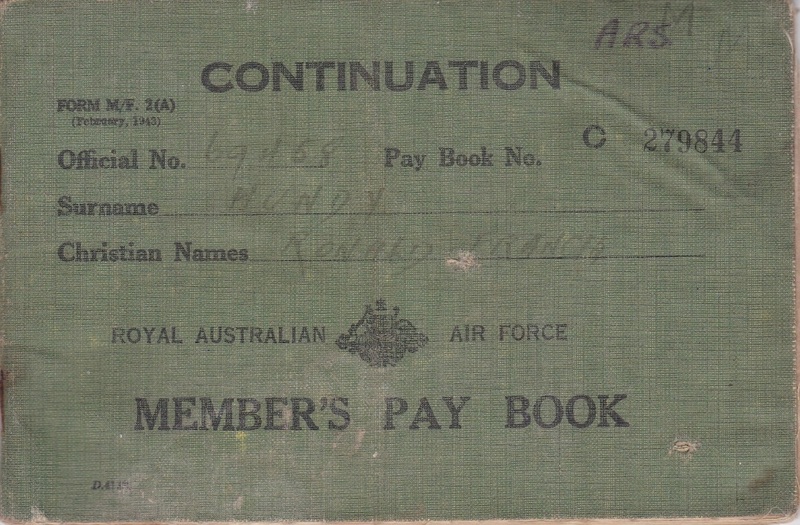 A dark green pay book named to 69458 Ronald Francis Hundy who was born on 9 Aug 1917, enlisted at Mudgee on 26 Aug 1942 and discharged as a Leading Aircraftsman on 25 Mar 1946 from No 2 Aircraft Depot. BO935. 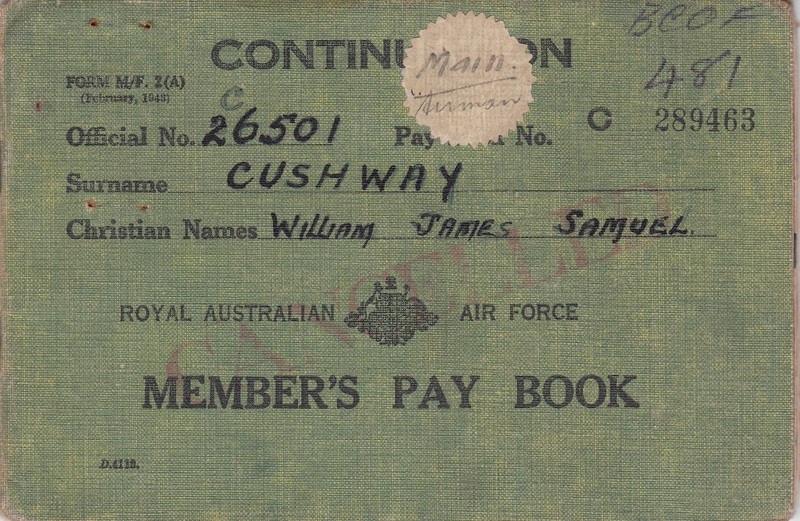 A dark green pay book named to 26501 William James Samuel Cushway who was born on 6 Mar 1908, enlisted at Adelaide on 14 May 1940 and discharged as a Corporal on 23 Mar 1949 from Aircraft Research & Development Unit. BO935. 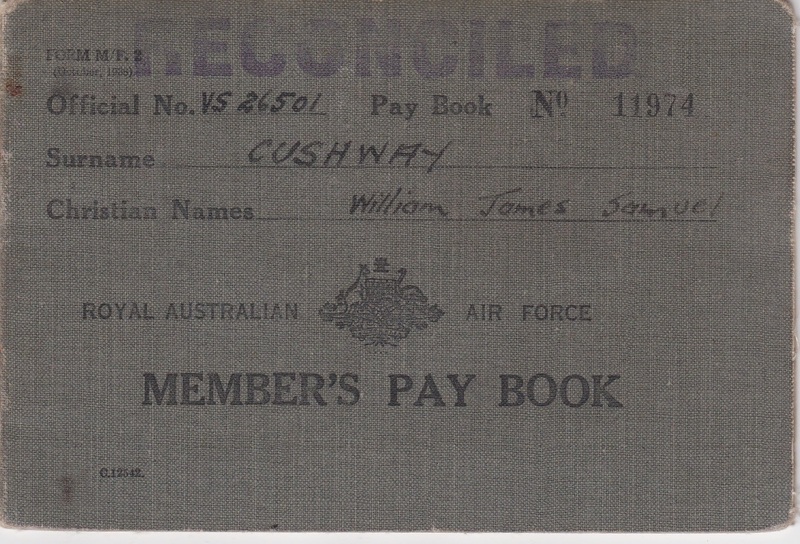 A mid green pay book named to 26501 William James Samuel Cushway who was born on 6 Mar 1908, enlisted at Adelaide on 14 May 1940 and discharged as a Corporal on 23 Mar 1949 from Aircraft Research & Development Unit. 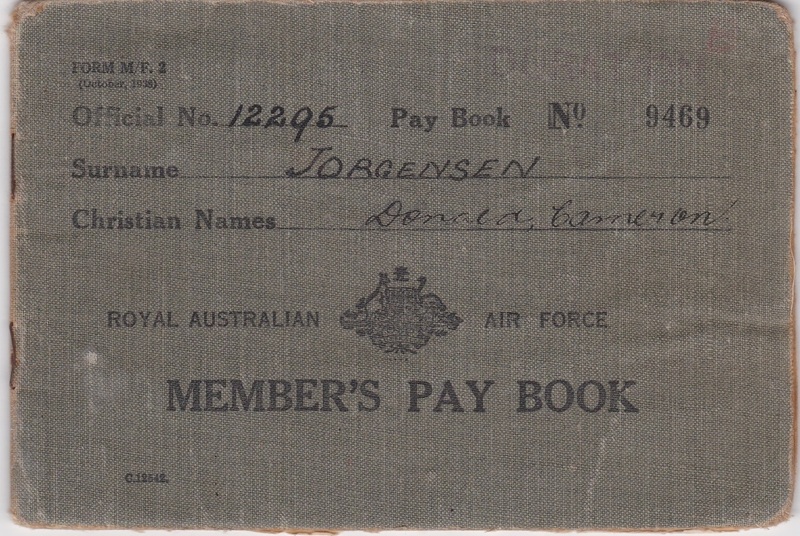 BO935. 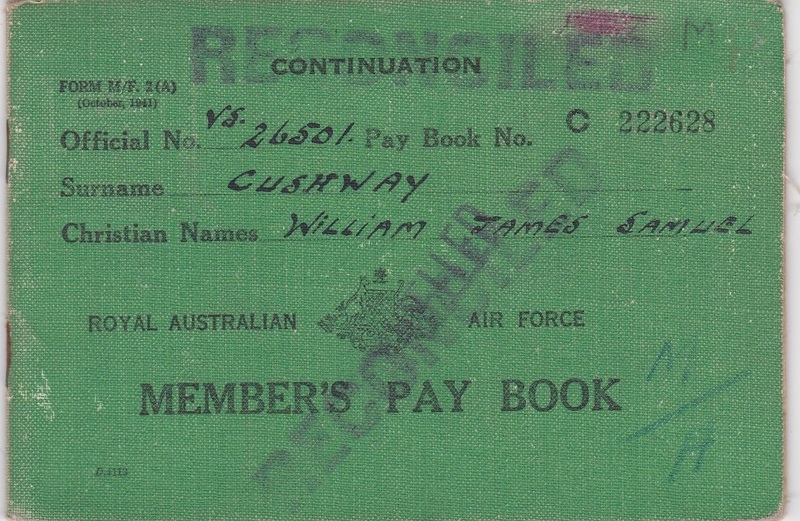 A light green pay book named to 26501 William James Samuel Cushway who was born on 6 Mar 1908, enlisted at Adelaide on 14 May 1940 and discharged as a Corporal on 23 Mar 1949 from Aircraft Research & Development Unit. BO940. 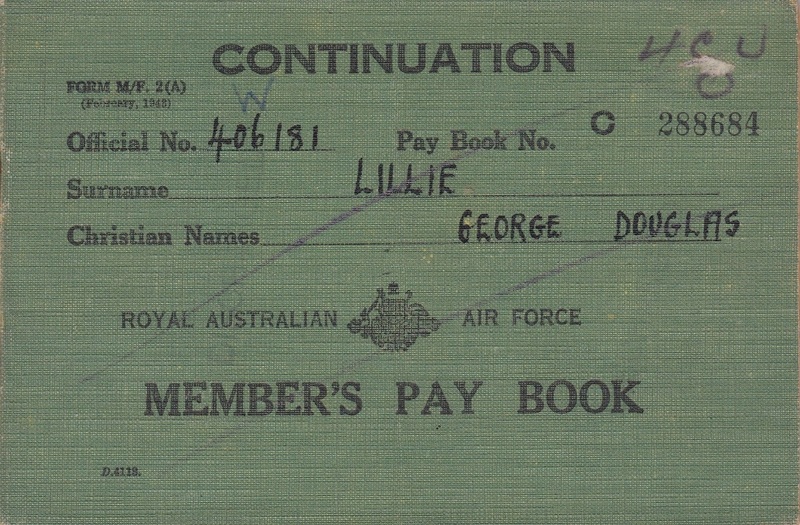 A dark green pay book named to 406181 George Douglas Lillie who was born on 13 May 1920, enlisted at Perth on 12 Sep 1940 and discharged as a Flight Lieutenant on 12 Dec 1945 from No 4 Communications Unit. BO940. 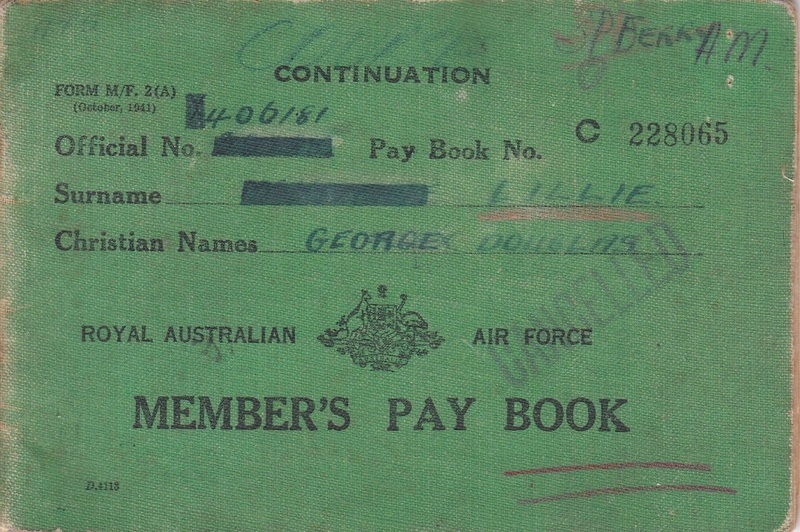 A mid green pay book named to 406181 George Douglas Lillie who was born on 13 May 1920, enlisted at Perth on 12 Sep 1940 and discharged as a Flight Lieutenant on 12 Dec 1945 from No 4 Communications Unit. BO940. 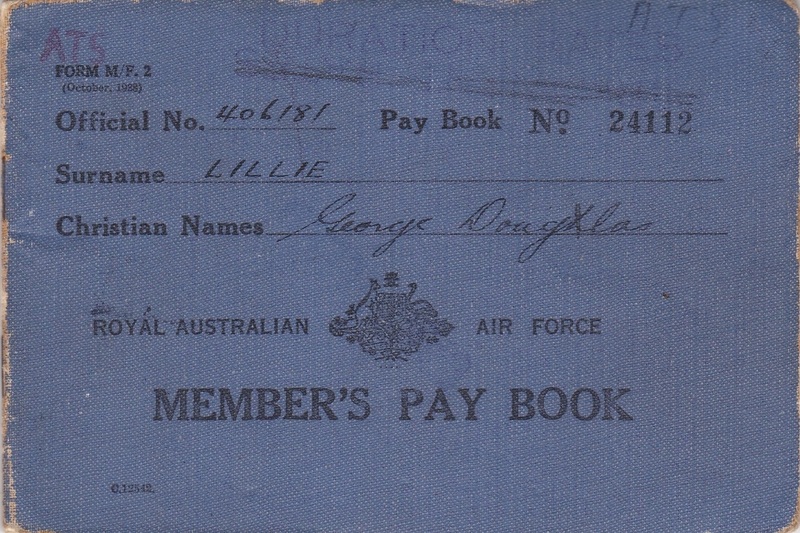 A blue pay book named to 406181 George Douglas Lillie who was born on 13 May 1920, enlisted at Perth on 12 Sep 1940 and discharged as a Flight Lieutenant on 12 Dec 1945 from No 4 Communications Unit. BO951. 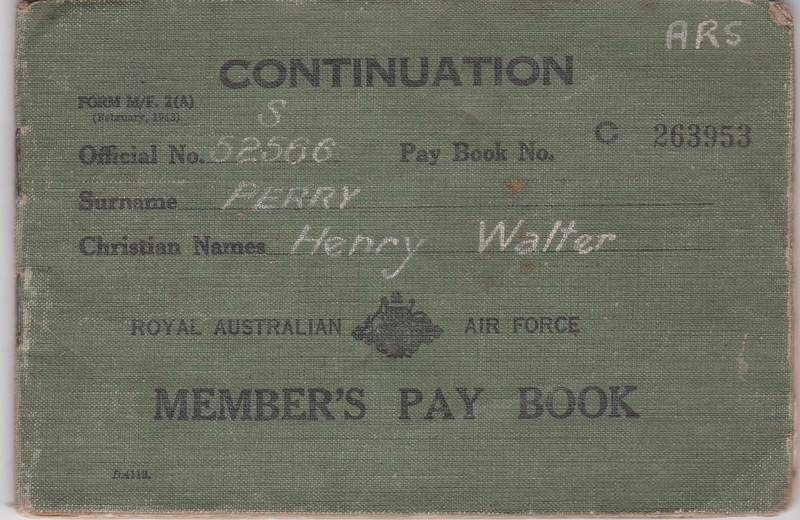 A dark green pay book named to 52566 Henry Walter Perry who was born on 5 Sep 1899, enlisted at Melbourne on 28 Mar 1942 and discharged as a Corporal on 26 Jan 1946 from No 6 RAAF Hospital. BO956. 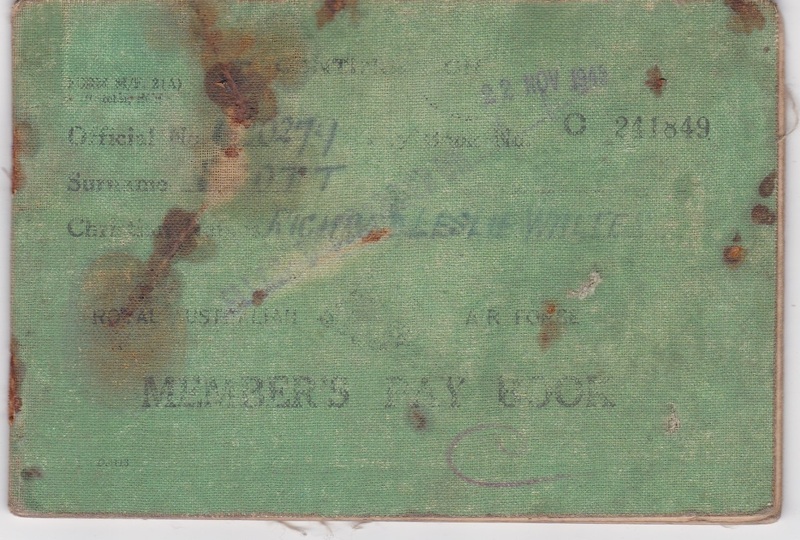 A green pay book named to 420279 Richard Leslie Walter Scott who was born on 15 May 1912, enlisted at Sydney on 11 Oct 1941 and discharged as a Flight Lieutenant on 22 Nov 1945 from Air Force Headquarters. BO956. 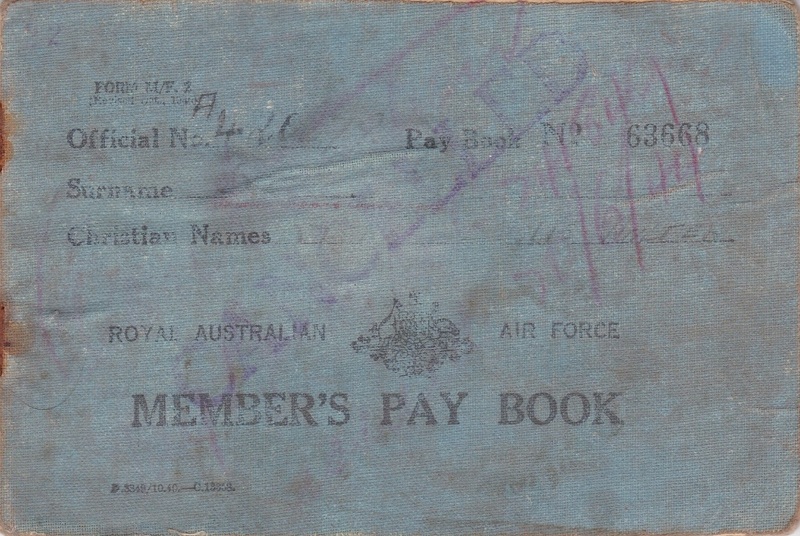 A blue pay book named to 420279 Richard Leslie Walter Scott who was born on 15 May 1912, enlisted at Sydney on 11 Oct 1941 and discharged as a Flight Lieutenant on 22 Nov 1945 from Air Force Headquarters. BO982. 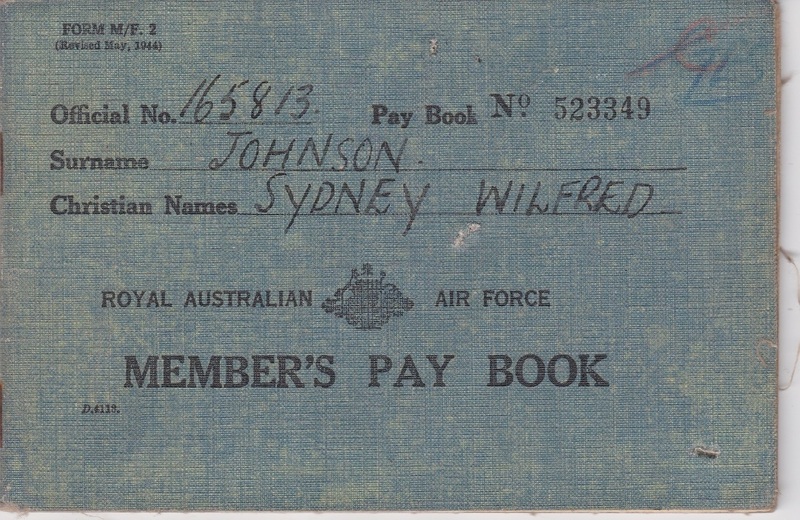 A green pay book named to 165813 Sydney Wilfred Johnson who was born on 29 Nov 1910, enlisted at Woolloomooloo on 19 Sep 1944 and discharged as a Leading Aircraftsman from No 2 Aircraft Depot. BO984. 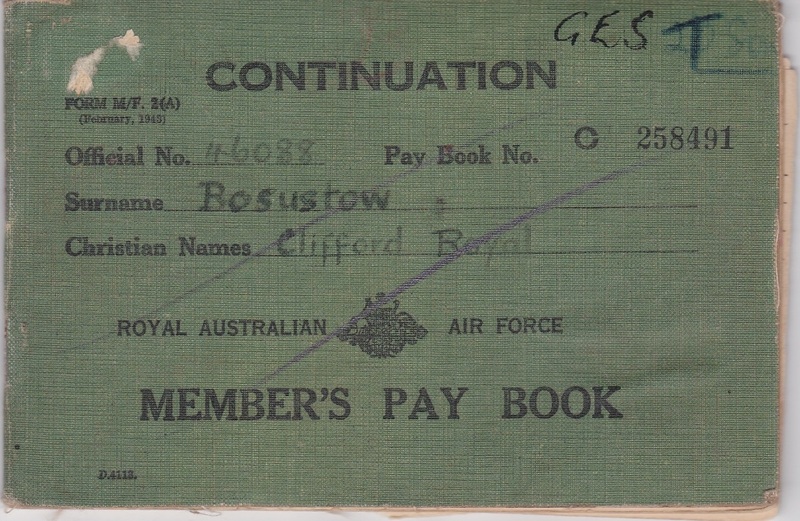 A green pay book named to 46088 Clifford Royal Bosustow who was born on 17 April 1913, enlisted at Freemantle on 10 Dec 1941 and discharged as a Corporal on 4 Dec 1945 from 5 Aircraft Depot. BO984. 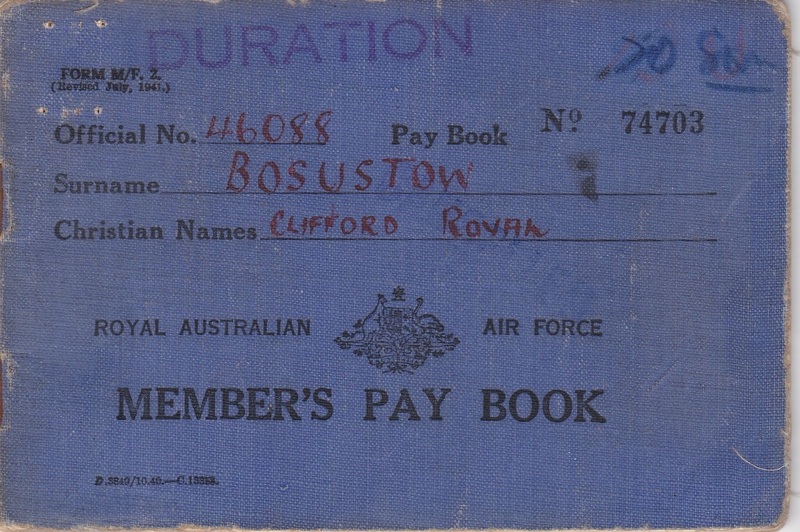 A blue pay book named to 46088 Clifford Royal Bosustow who was born on 17 April 1913, enlisted at Freemantle on 10 Dec 1941 and discharged as a Corporal on 4 Dec 1945 from 5 Aircraft Depot. BO999. 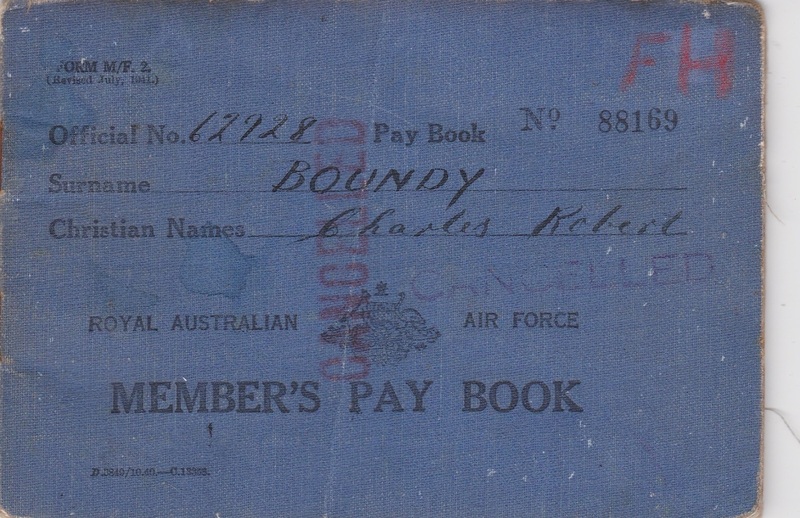 A blue pay book named to 62928 Charles Robert Boundy who was born on 18 Feb 1915, enlisted at Rozelle on 16 Mar 1942 and discharged as a Leading Aircraftsman on 4 Dec 1945 from 12 Aircraft Repair Depot.